Nestled in the mountains of Western North Carolina is beautiful Lake Chatuge. In 1942, the TVA constructed a 2,950 foot earth fill dam across the Hiawassee River, forming Lake Chatuge. Visitors enjoy leisurely strolls along the dam with its spectacular view of the lake and surrounding mountains. With over 130 miles of shoreline, the lake has numerous fingerlike projections of land forming interesting coves for great fishing, swimming, boating, and water sports. The 130 miles of shoreline around Lake Chatuge is magnificently framed by the nearby Tusquitee Mountains and "the Great Blue Hills of God," as the Cherokee called the Blue Ridge Mountains. The Chatuge Dam is 144 feet high, and the lake supports water sports and recreation. The fishing is good with more than 32 species in the lake. Jackrabbit Mountain Recreation Area is situated on a pine-wooded peninsula with hiking trails that offer pleasing views of Lake Chatuge. 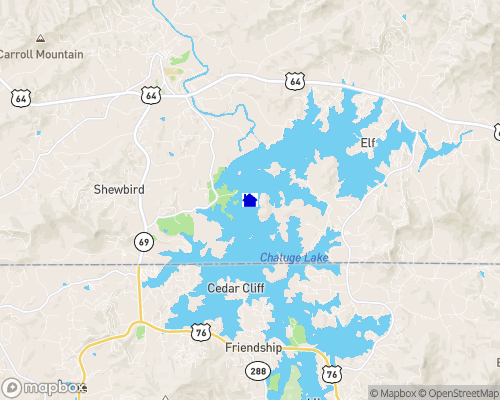 The dam is made up of 21,900 cubic yards of concrete, and there was 362,466 cubic yards of earth excavation for the foundation.Normal maximum pool for Lake Chatuge flood control holds 7,050 acre feet of water. Water Level: Average water level variance? 5 ft. Nearby cities: Hiawassee, GA 5 miles; Murphy, NC 10 miles; Franklin, NC 45 miles; Blairsville, GA 15 miles. Building restrictions: Home built in NC have to be built to the NC Building Code adopted by the state.